Now with exam and graded certificate! Design Thinking - a multi-stage innovation process that focuses on human needs. Understand theoretical foundations and practical techniques, whether your are a manager, entrepreneur, designer or student. Welcome to the Macromedia University Design Thinking MOOC. The Macromedia University MOOC Design Thinking is about understanding and implementing the methodology of Design Thinking. You will learn how Design Thinking uses creative, human centered techniques as a strategic approach to stimulate innovation. At MHMK, Macromedia University of Applied Sciences, we believe that human needs and experience should drive innovation – not technology. Being a school whose graduates will engage in designing the digital landscape surrounding us, we like to share our conviction of a good, decent and ethical way of creating tomorrows products and services. The Macromedia MOOC Design Thinking links theoretical frames with practice. You will look into fundamentals like historical and theoretical aspects of design, design models and design systems. You will gain deeper insights into the Design Thinking methodology and the human-centered design approach. You will learn how to apply teamwork and communications skills, and you will hear about creativity methods and visualization tools in the context of strategic design. And last but not least, the Macromedia MOOC Design Thinking will teach you how to evaluate ideas and concepts and why an innovation attitude and intercultural communication competence is crucial for a successful implementation. Week by week we invite you to meet academics, professionals and students, who are using Design Thinking in the creative industries as well as in management in order to solve problems of great complexity. Each week is divided into three or four lectures/chapters. Each lecture is divided in several lessons/units, which are usually not longer than 5 mInutes. The lessons are made of video material, slides, additional reading material and tasks. Expect to view approx. 80 minutes of lectures per week which sums up to altogether 5 hours per week incl. self-study time. Originating in the Design Department of MHMK, Macromedia University of Applied Sciences in Munich, the Macromedia MOOC Design Thinking is emphasizing the rewarding link between management and creativity. To us, managing creativity means drawing on various findings and multidiscliplinary methods, yet guiding them through standardized and verifiable management procedures. Besides Design and Art history, the background of our MOOC team therefore ranges from business, psychology and human resource to transmedia, visualization, narration, and journalism, for instance. We will thus be able to discuss Design Thinking from various perspectives. 1. What is Design Thinking? Which benefits may I expect when implementing it as a management strategy? 2. How can innovation be systematically triggered ? How can I implement Design Thinking into my own projects? 3. Talking about the potential of Design Thinking – what kind of best practices are there ? 4. What kind of team do I need to in order to initialize a Design Thinking process? No prior knowledge of Design Thinking is needed in order to attend the MOOC. Interest in creative techniques, innovation and management is welcome. - You don't know what human centered design, strategic design or participatory innovation culture is? - Great, you'll learn it here. - You are a business development specialist? - Great, we hope to inspire you. Please feel free to help us inspire others by sharing interesting links, events and projects on our Facebook page. We would be happy to keep you posted! Become a friend and follow the conversation! Prof. Oliver Szasz (Vice Head Graduate School Munich, MOOC Project Director) developed the concept and design for the Macromedia University MOOC Design Thinking and oversaw the overall production. Oliver Szasz is professor at MHMK Macromedia University for Media and Communication in Munich, Germany. In his current position, Professor Oliver Szasz teaches design theory, interactive media, design ethics and experience design in the Media and Communication Design Faculty and the Media and Design Master School. His primary research areas of interest include design thinking, human-centered design, design ethics, ethnographic research, experience design, service design, sustainable development, cultural studies, philosophy and design theory. 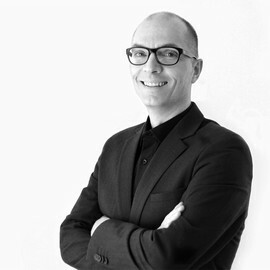 Prior to joining MHMK Macromedia University, Oliver Szasz held positions as a design lecturer, art director and senior designer and worked in diverse places, such as London, Cape Town, Grand Cayman and Barcelona, before establishing his own interdisciplinary design studio in London in 2001. Oliver Szasz studied sociology, philosophy and political science at Augsburg University prior to his studies in communication design (Dipl.-Des. FH) at University of Applied Sciences in Augsburg. He received his Master of Arts degree (M.A. Design Studies) from Central Saint Martins University of the Arts (CSM), London, which he passed with distinction.